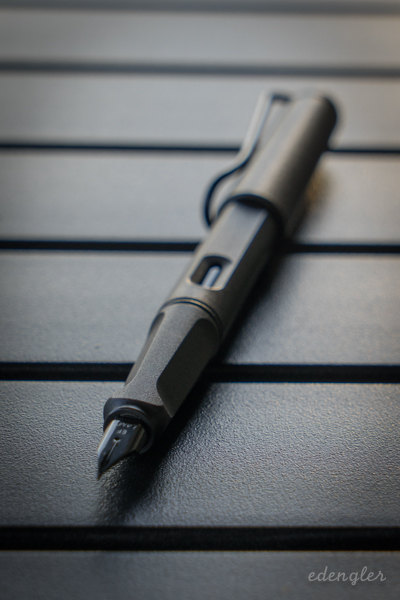 Ed, the Lamy Safari is a great choice for an everyday carry. I have the Vista (demonstrator) version of the pen. Just out of curiosity, what ink are you using with the pen? Freddy I have Noodlers black in it. Enablers .. the both of you! (11-05-2014, 06:31 PM)eengler Wrote: Freddy I have Noodlers black in it. Right now my Safari/Vista is out of rotation but because it is a demonstrator I usually like something with a bit of splash in it so a red or green is more likely. Think Diamine Oxblood (red) or Private Reserve Avacado (green... and I do wish Private Reserve would correct their spelling or give a reason for the spelling of Avacado ). Nice Freddy, maybe a second pen is in my future with color ink. I do like the clip on the Safari. It's not the most elegant looking however it will accommodate my trouser pocket easily. (11-05-2014, 07:33 PM)Agravic Wrote: Enablers .. the both of you! I believe we all can add that to our credentials Ravi. Congratulations, Ed! Those are fantastic pens for the price! I have quite a few and that was my first FP! Ed, I actually like the clip for its look, sort of Industrial Chic. That's a good description Freddy. It does fit the overall look of the pen well. I have four of those, extra fine, fine, medium, and broad. I'm prepared for what ever mood I'm in. I just use either good old Waterman or Parker blue ink. (11-06-2014, 12:33 PM)Johnny Wrote: I have four of those, extra fine, fine, medium, and broad. I'm prepared for what ever mood I'm in. I just use either good old Waterman or Parker blue ink. I'm new to fountain pens, and this is what I'm using daily to practice my penmanship. I picked up a kit that included the converter and a bottle of Lamy black ink. So far, it's been a great experience! (01-26-2015, 09:45 AM)kansaskyle Wrote: I'm new to fountain pens, and this is what I'm using daily to practice my penmanship. I picked up a kit that included the converter and a bottle of Lamy black ink. Welcome to both the Shave Nook in general and the Ink Well forum specifically. Great bunch of pen people here who are more than willing to help out and offer advice. Be advised this pen stuff can be addicting. I received a fountain pen on Christmas 2012. Between my wife and I we now have 25. Plus inks, and stationery and ink wells. To me, fountain pens are like our shaving gear. Quality doesn't always mean high priced. Of course, there are some beautiful fountain pens out there with high price tags and they are worth every penny. However, more and more, I am finding that some of my less expensive pens write very smoothly and are great for Everyday Carries because I won't be as upset about losing a $25.00 pen as I would be a $200.00 one. I'm addicted to the cheap Chinese FP's on Ebay. I just bought a dozen of them. Update! After 13 months of daily use this Safari is still performing well. The EF nib has smoothed out nicely using the same Noodler's Bulletproof Black ink for the duration. It shows some shiny wear to the barrel and clip, as I keep it inside my pants pocket. One thing to note is the cap retention has relaxed some and I have found it uncapped in the bottom of my pocket several times, thankfully without incident. Wonderful everyday pen! When one finds that perfect EDC fountain pen, it is a real joy. Mine is a Kaweco Sport with an EF nib. After a few years of daily use, mine is pretty beat up but still serviceable. However, I just recently replaced it with a new Sport and have posted it elsewhere in the Fountain Pen thread. Enjoy your Safari, Ed. Mine EDC is an Al-Star All Matte Black with M nib. I have other safaris, kawecos and a sheaffer but this one gets most of the love.